«« previous: Can YOU guess which hand the ball is in? 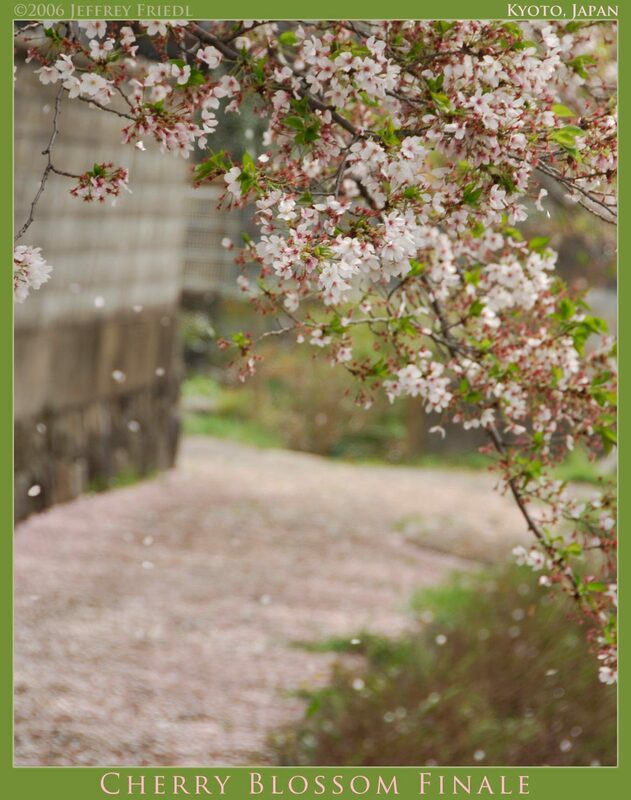 When a cherry tree starts to give up its petals, it does so in great bursts and flurries. A puff of wind will come along, and every darn petal will spring into the air in a veritable supernova of off-white pink that becomes a localized blizzard as it swirls and dissipates in all directions. Gravity eventually wins, and the ground becomes a thick bed of blossoms sometimes several inches thick. It's beautiful and mesmerizing, but the most amazing thing about it is that after every petal has been lost to that breeze, the tree remains as heavily laden as ever. It's as if the blossoms for the blizzard of petals had materialized out of nowhere, separate and unrelated to those affixed to the tree for your longer-term viewing pleasure. It certainly defies all logic, but that's how it is. Like watching hair grow, you never see a change in a tree's petals over the short term, but in the longer term the tree inexplicably, inexorably, inevitability turns from white to green. This year, as I've mentioned before, each tree seems to be going at its own pace, but all have at least started the transformation now. Anyway, after our recent trip to the park, Anthony and I were passing by the area were I took that night shot I'd posted recently when we were greeted with one of the whirlwinds of blossoms. I had my camera with me, but I wasn't fast/good enough to get a picture that did it justice. It's interesting to note that the white path in the background is black asphalt, made white by a thin layer of petals (we've had a lot of rain recently, putting a damper, literally, on the petal accumulation). It's taken from just about exactly the same spot as the aforementioned night shot, but looking the opposite direction. You can see much less an accumulation in the night shot, which was taken not long after rain had cleared everything away, a good 40 hours prior to this one. April 18th, 2006 Can YOU guess which hand the ball is in?